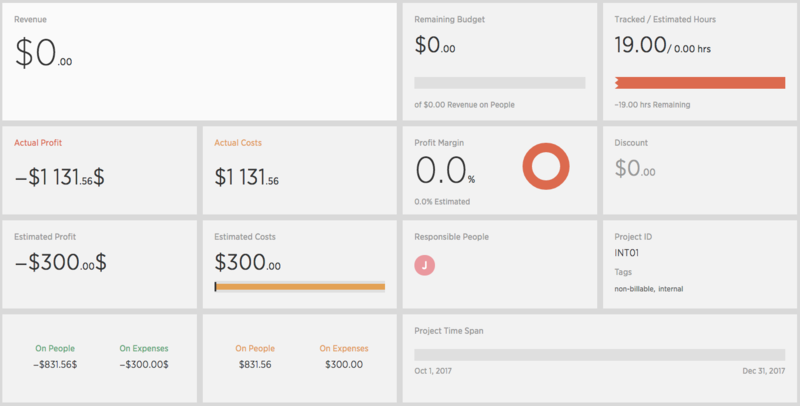 Track all your expenses, even the ones you spend internally. Learn how to do it through internal projects. 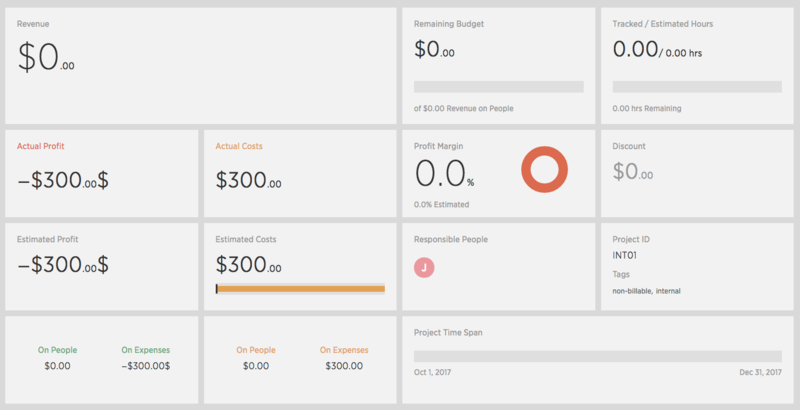 Tracking internal projects is critical to learn whether it’s really worth spending as much money and time on them. Your goal should be selling as many man-hours in billable projects as possible, so it’s wise to invest only in those internal projects which are really worth it. PR promo is a kind of internal project where you track all the time spent on promoting your company – blog posts, social media channels, etc. A monthly check of how much it costs you is a good idea, as you can easily see how much time and money your people spent on these activities. These expenses can then be compared to how much it helped you – new business, new followers, published articles, etc. Was it really worth it, or does it make more sense to spend this time and money elsewhere? We advise to create all internal projects as RECURRING projects, simply because they don’t require any upkeep. They only have to be created once and Costlocker will take care of automatically closing and opening them. Select the RECURRING option, because you want the project to be automatically duplicated in the frequency of your choice (monthly, quarterly, annually). Enter the project name without any time reference. As soon as it’s created, the month, quarter or year will be automatically appended to its name. Pick yourself as the client. If it’s the 15th of the month today, but you want internal projects to start on the 1st day of the month, enter the 1st month of the current month – that will create the internal project for the current month as well. Now choose the frequency of this project’s duplication. We suggest the quarterly setting, as you most probably evaluate your financial results on quarterly basis. The last part of the 1st step asks you what should happen with the project by the end of the quarter. We suggest the Finish automatically setting, as the project will then be automatically closed and moved from running projects to finished projects. The costs will therefore reflect in all finished projects, reducing their overall profitability. We suggest defining the Internal and Non-billable tags here. Learn why tags are important, how they work and where you can define and edit them in bulk. People can be added to the project through activities into which they will be tracking. It’s therefore recommended to use a single activity for all internal projects – e.g. Internal tasks. Add all the people who can track time on this project. You’ll probably want to add all people to internal projects – it’s therefore not necessary to add them one by one. Just use the Add all people option to add everyone at once. 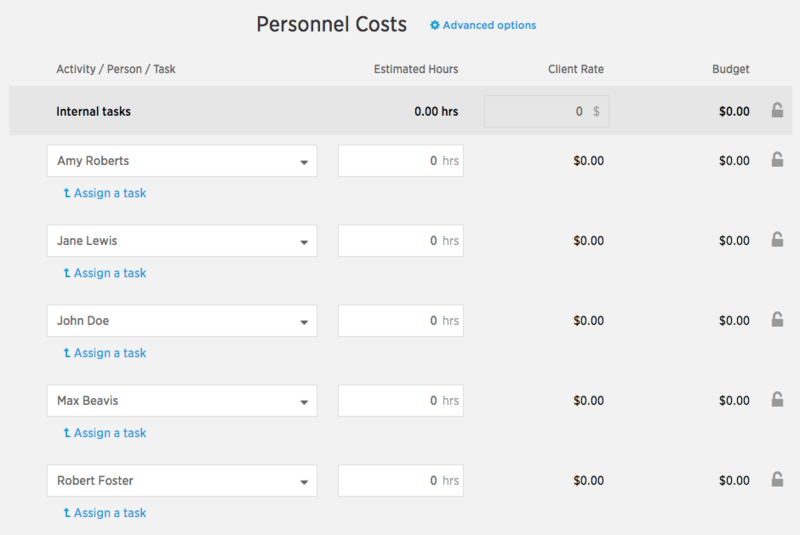 Next, enter 0 in everyone’s Estimated hours field, and another 0 into the Client rate, since the project has no budget. Most internal projects don’t have any external expenses, at least not when they are being created. This step can therefore be skipped by clicking the Skip button. 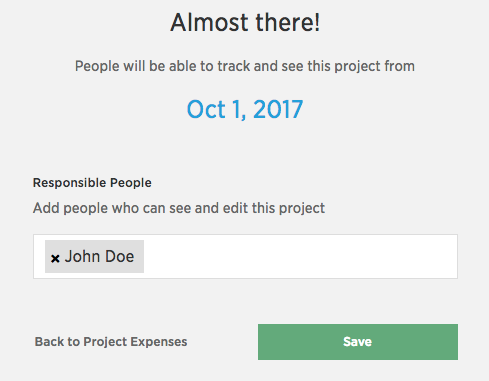 Use this screen to set up the date from which people will see the project in their time tracking, as well as who can edit this project along with you. See our guide on how project supervisors work to learn more about them. The project has now been created and is ready for the first quarter. The expenses on the project are now 0, except for the current costs of $300. That’s because we entered the external expense on business cards. If there were no external expenses, this metric would read 0 as well. It can be easily seen that people have tracked 19 hours so far (Tracked hours), and that the total tracked time costs + external costs are $1.131. The breakdown can be seen below the total. That means that the 19 hours your people tracked represent $831 in expenses, and the remaining $300 were paid for the business cards. 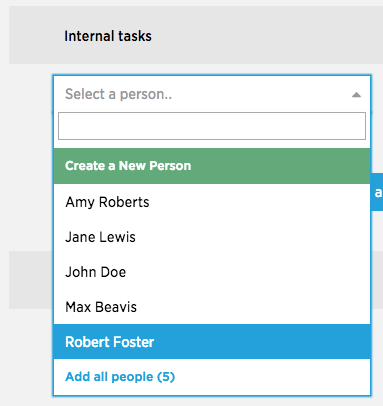 When the time comes to create another internal project, definitely use the handy project duplication feature. As internal projects only differ in their names, it’s easy to create new ones by duplicating existing projects.